The new year is upon us and in the middle of looking forward with resolutions and looking back with “best of” lists lies a night of celebration. wine drinkers thoughts turn to that most celebratory of wines: Champagne! Yes, there are many different sparkling wines out there — Prosecco, Cava, Sekt, Asti, Sparkling Shiraz or Baga — but Champagne sets the standard for all of them; so much so that “methode champenoise” was originally used to describe the way they are made (today “methode traditionelle” or the language equivalent is used). Take a bottle from a major champagne house with you to a party, and people will notice. Top flight champagne can be pricey. A prestige cuveé like Louis Roederer‘s well-known vintage Cristal can set you back upwards of $250 for a bottle. If you’ve got it like that — and are prepared to hold it until it matures — buy it. Originally blended for Czar Alexander II of Russia, Cristal had its reputation long before the rappers discovered it. But as typical of Champagne “houses,” Louis Roederer’s house style is established with its non-vintage Brut Premiere. Offering pome fruit and toasty brioche on the palate, this classically-balanced wine can be had for about $50. And our “High” offering gives a striking visual as well: it comes in a bottle that is essentially a brown-glass version of the Cristal clear bottle. Want the Roederer quality — and cachet — but on a tighter budget? Several of the major houses of Champagne maintain an American operation* and Louis Roederer is no exception. Roederer Estate, their American arm, makes sparkling wines in California’s Anderson Valley that can rival the best Champagnes. Their non-vintage Brut, our “Low” offering, adds oak-aged reserve wines to the blend in order to obtain what they call “the fresh, somewhat austere style that is one of the characteristics of Roederer wines.” It is available for around $20. While it’s labeling is unique, its gold-on-brown color scheme is the reverse of its French counterpart’s brown-on-gold meme: distinct, but noticeably part of the family. And Roederer Estate has their own vintage Tête de Cuvée, the consistently top-rated L’Ermitage made only in exceptional years. It can be had for about $50, or about what you’d pay for a house non-vintage Champagne. As noted above, other major houses have American affiliates — G.H. 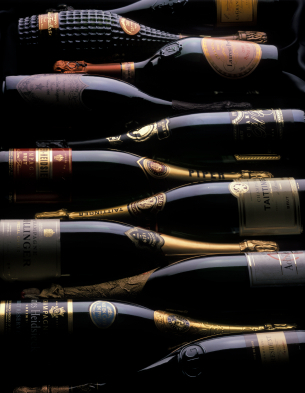 Mumm et Cie. (Cordon Rouge) has Mumm Napa, Taittinger has Domain Carneros, Piper-Heidsieck has Piper-Sonoma — and the price-point differentials are generally the same. You should be able to find at least one of them in most markets. There’s no reason not to have good bubbly to ring in the new year, so ring it in right! *This “Old World/New World” relationship is not limited to sparkling wines or even to California. Oregon’s Domaine Drouhin is the new world arm of the acclaimed Burgundy family négociant business, Joseph Drouhin; and Rhône Valley standard-bearer Château de Beaucastel is principal stakeholder in Paso Robles’ Tablas Creek. Look for these in future High/Low articles.